Our approach is simple – we focus on excellence in all that we do. At Media 21 Limited we believe that we must always combine the best talent in order to provide service with uncompromised integrity and unparalleled technical support. It is for this reason we enforce the idea of Company investment in human capital, training and trust to encourage employees to always “do the right thing” when at work and in their communities. We are continuously upgrading and investing in cutting-edge technologies to provide effective solutions to the multi-media challenges of our clients. It is our conviction that only the best tools will allow us to deliver the promise of excellence to our clients. We spend the time to listen to the needs and understand the circumstances of every project to fi nd individual solutions for individual challenges. 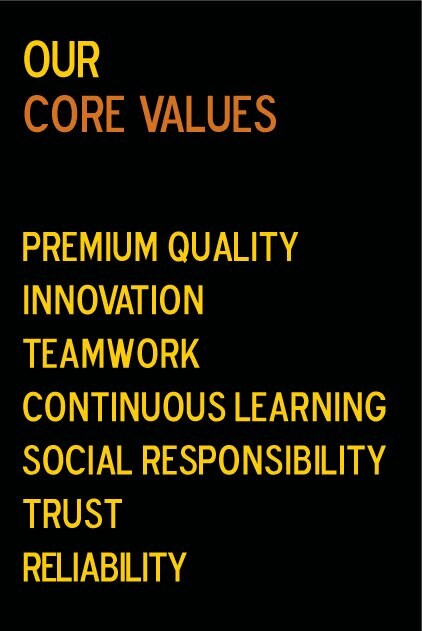 Our core values are based on our philosophy to take responsibility for what we do, especially for our customers, our staff, our partners and the people around us. We believe in giving back to the community in which we serve. This perspective guides the way we conduct our business and inspire our future plans for development.